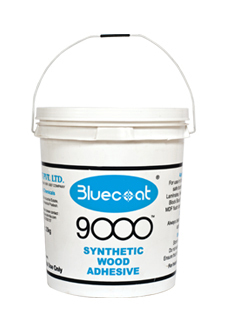 Bluecoat 9000 is widely used for all Types of Wood, Cold Press/Hot Press and Post forming applications. For the purpose of bonding Paper/Cardboard/Thermocol/Book-Binding, Pencil Manufacturing, Handicrafts and Paper Tube Making. Powerful Bond Strength. Suitable for Vertical/Horizontal applications. Prolonged shelf life without affecting the quality on storage. Economical in a long run, since it ensures long life of furniture. Free from grits & lumps for easy application. Special preservative used to protect adhesive from any bacterial growth during storage. "Zero Wastage Pack" - New International bucket packing with an in-built small lead on the main cap for minimum wastage, free from dust, grease, any foreign particle and for minimum skin formation.